Oh the agony of no fish. Oh the pain and ignominy of no bites, no interest and no trout. Today, no tricos hovering over the surface, no hoppers in the field and no caddis at night. The world becomes unjust and without hope. Emptied our entire fly box in the water and nothing. 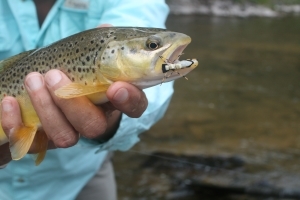 Cool weather approaches and with it comes hope of more aggressive fish. Blue winged olives (size 14’s) and Yuk bugs size 8. Blow ill wind blow.